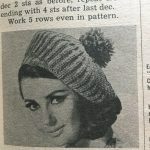 In the September 1967 issue, one pattern I started immediately was this beret. Just one problem. At first, I overlooked the original stitch pattern and looked up an alternative. Turns out the stitch pattern IS there, but it isn’t actually right! The stitch pattern listed makes a beautiful stitch that I just adore, BUT it is not ribbed at all like the photo. I shared a picture on Instagram of how it didn’t match up, not even a little, not even at all. As you can see, no ribs. You can see the 1967 Ribbed Beanie on the left and the 1967 Beret on the right! 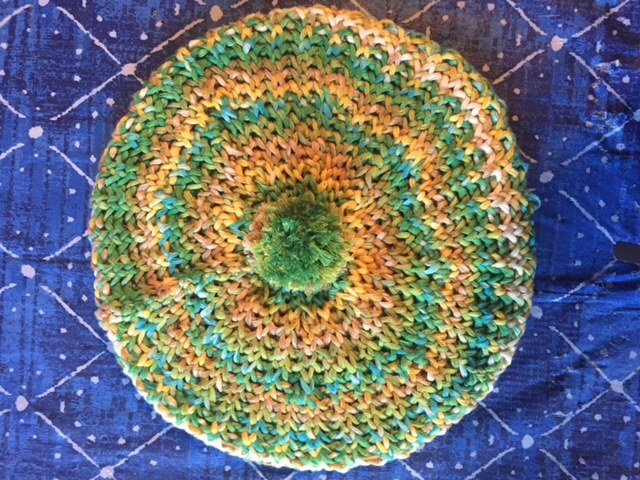 Here is the pattern for the original hat, a beret, but with no ribs. At the end of this pattern, I will link to the Ribbed Beanie, which is the hat I designed to create a hat that actually looks like the original picture! 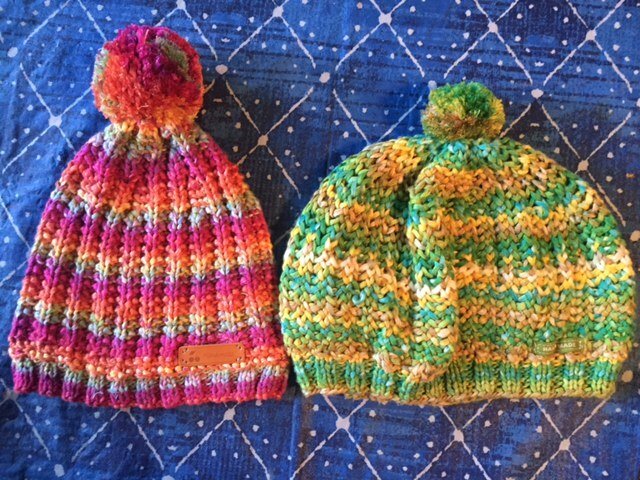 Both hats are knitted flat and seamed. Both methods of stitching create a nearly invisible seam when sewn well. The Seam of the Ribbed Beanie is less obvious than the beret. 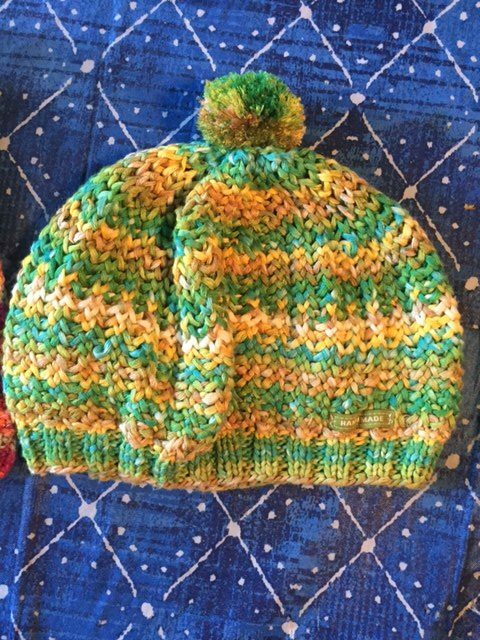 My Samples are made using: Nicole Studios “Paintbrush” Yarn- bright beanie and the 1967 beret, Peace Fleece wool- green Ribbed Beanie, Cascade 220 Superwash- Yellow Beanie. The silky Paintbrush yarn does create a loose drape, while the stiffer wool is thicker and warmer. Any worsted weight yarn will work. The Paintbrush yarn is labeled as a bulky, but knits up fine as a worsted. 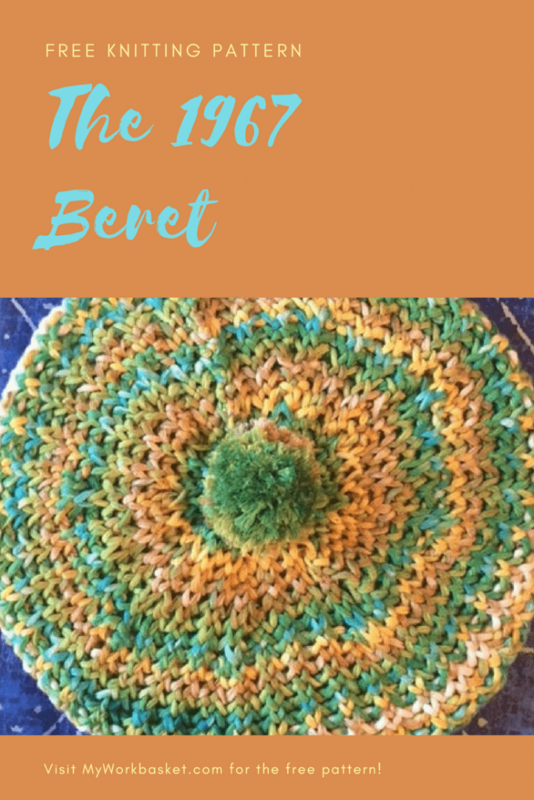 I would say the beret is an easier pattern, however, neither is hard. If you’re not familiar with this stitch I made a video to help you! It’s quite easy but it does sound and feel scary at first! It does not make ribs but does make a wonderful loose and drapey fabric. When knitting in a stiff yarn, like wool, it is less drapey than my sample. I did several swatches to check. Switch to size 8 needles and decrease 10 stitches evenly across the row. It doesn’t have to be perfectly spaced, just not decreases back to back. First Decrease Row- *Work 7 stitches in pattern, slip next two stitches in patterned stitch, knit one, pass the slipped stitches over the knitted stitch. 3 loops passed over. Repeat from * around, end with 4 stitches in pattern stitch. Fourth Decrease- *Knit 1, Decrease Repeat from * around, end with 4 more stitches. Fasten off yarn leaving 12″ end. Draw this end through all the remaining stitches and pull them tight. fasten securely and sew back seam. Use remaining yarn to make a pom pom. I have these gadgets that I love for pompoms, but you can use whatever method you like! Sew the PomPom securely to the top of the hat! If you want to make the RIbbed Beanie, it’s right here! This Pattern is also on Ravelry!